The dream wasn't supposed to die like this. Not with Kade Hustler and Connor Fajardo ripping out their untucked jerseys in frustration, trying to exit the Chiles Center floor flummoxed and visibly frazzled. Not with some of the Southridge boys basketball team staring up the scoreboard in utter disbelief. Not with the Skyhawks' lowest scoring output of the season. If you're going to go out, do so with guns blazing, no bullets left the chamber, playing great ball was the goal. Maybe Southridge started believing its own hype. Maybe they caught the yips at the most unseasonable time of the year. Whatever the case, Lincoln was lying in wait and when the Skyhawks suffered through its worst offensive outing of the year, the No. 14 Cardinals capitalized, upsetting No. 3 Southridge 39-36 in the Class 6A quarterfinals on Thursday. The Skyhawks, who rightfully possessed state championship aspirations after winning the Metro League for the first time in school history and earned the No. 3 seed in the 6A bracket, won't get a shot at that state title they so craved. Instead, Southridge will have to win its way through the consolation bracket and play for fourth place. The Skyhawks face West Salem at 10:45 a.m. on Friday. "This one hurts," Southridge senior Bradley Bickler said. "I think it came down to who wanted it more in the end. I know we wanted it, but they came out more ready than us from the start. They jumped on us and we weren't ready. They were a physical team, that's pretty much it. We have to flush it because we're still playing for something." The Cardinals weren't necessarily better personnel-wise than Southridge. The PIL representative only shot 23.8 percent from the floor and 5-for-27 from three. Lincoln's offense was equally as anemic. While Bryce Sloan starred with 23 points, Southridge's defense had little trouble keying in on the rest of the Cardinal supporting cast. Where the game went awry, Bickler said, stemmed from a sort of overconfidence on Southridge's behalf. As the decided favorite predicted to move on and face Grant in a battle royal semifinal bout on Friday, the Skyhawks stumbled and miscalculated the task in front of them. "I think we might have overlooked them," Bickler said. "We didn't come out ready. We didn't come out physical or strong enough mentally. We were looking at (playing) Grant. That's what happens when you don't come out ready to play." The shots didn't drop all night and the finishing kick so many of the Skyhawk faithful expected never came. The Skyhawks missed their first 19 three pointers and finished the game 1-for-20 from deep. 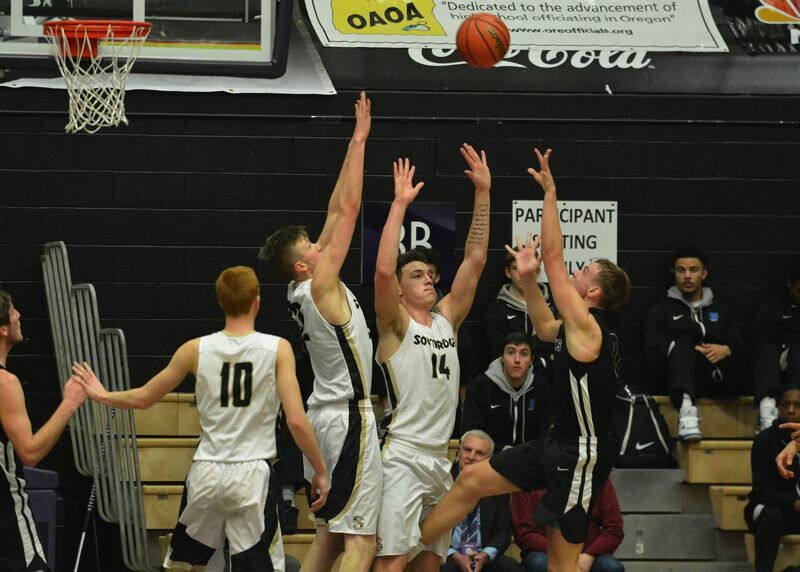 Southridge shot just 28.9 percent from the field (13-of-45 field goals), missing a number of chippies around the rim in the second half that ultimately haunted the Skyhawks down the stretch. At the end of three quarters, Southridge trailed Lincoln 26-23. This is a Skyhawk team that put up 23 points in one quarter alone against Oak Hill Academy, the top-ranked high school team in the country, at the Les Schwab Invitational. Their reputation for microwave-quick shooting sprees proceeded the Hawks. But in a game Southridge obviously needed, its shooting touch abandoned them. "We'd never played here before, it's a big arena with new rims, but when we can't hit shots outside, that's when we need to go inside," Bickler said. "We weren't scared, but we played like it. We just needed to man up and play." For all the talk about one game at a time and taking it day by day, it's human nature to look ahead, to envision the future, especially with high school players. It's hard to put the blinders on when pats on the back and positive exposure are prevalent. And to Southridge's credit, the Skyhawks never folded up the tent, even when missed shots piled up and it seemed like an oversized lid was covering the rim. Lincoln led 14-4 at the end of the first quarter, but Bo Quinlan started to get going by taking the ball to the rim, Filip Fullerton made a layup off a high-low pass from Bickler and Brock Henry made two three throws to bring Southridge within 14-12 midway through the second quarter. 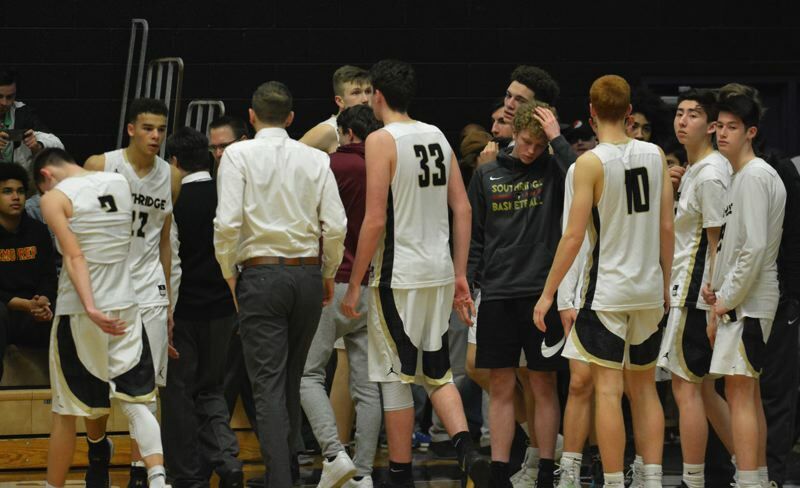 Southridge never trailed by more than five the rest of the way, but the Hawks never went on that game-changing surge, the kind of licensed tidal wave swing that shifts a deficit into a double-digit lead. Neither team looked particularly comfortable casting away in the Chiles Center. Both squads created ample open looks for their best shooters. But, the Hawk sharpshooters simply couldn't find the range. Yet, for as poorly as Southridge played offensively, it still had chances to bail itself out of the jam in the fourth. Down 32-27 with just over four minutes to go, Fullerton banked home a layup among the hacking Cardinals down low to cut the deficit down to a single score game. Then, Quinlan curved around the Lincoln defense and lifted an off-balance layup off the glass to bring Southridge within 32-31. 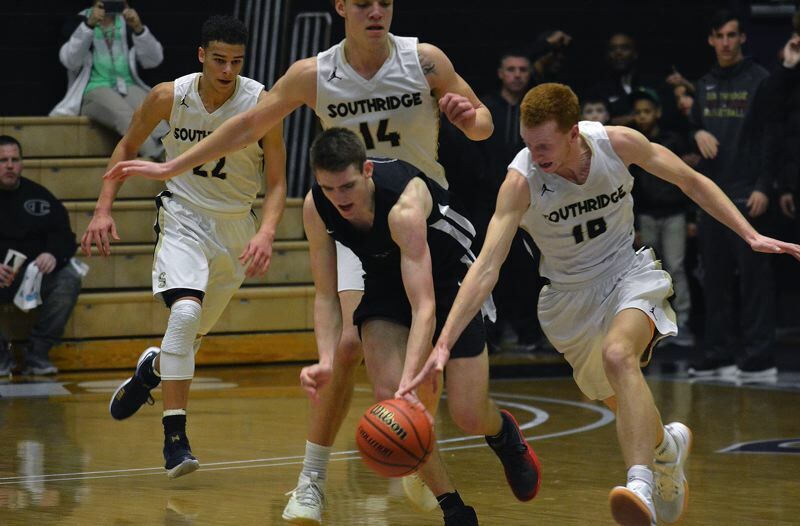 Even better, Southridge manned the glass on the ensuing possession and Fullerton pulled down the defensive board to give the ball back to Southridge with about a minute left in the fourth. However, as Southridge tried to set something up in the halfcourt, the Hawks turned it over. Sloan cashed in with two free throws to go up 34-31 and the Skyhawks missed inside the paint on the next trip down. Sloan made four more free throws in between a pair of Quinlan makes at the line to make it 38-33, yet Fullerton answered by swishing Southridge's first and only three of the game with 4.8 seconds to go in the game to cut Lincoln's lead to 38-36. And mercifully, Sloan stepped to the line, missed the first free throw, but made the second, leaving Southridge with the ball, down 49-46 with 4.8 seconds remaining and no timeouts. For all the unlucky bounces, ill-timed turnovers and empty possessions, this was Southridge's shot to make amends, to give itself new life and send the game to overtime where hope awaited. Henry, Quinlan, Fullerton or Zach Galvin could all hoist from anywhere inside the halfcourt line and give Southridge a chance at extra time. 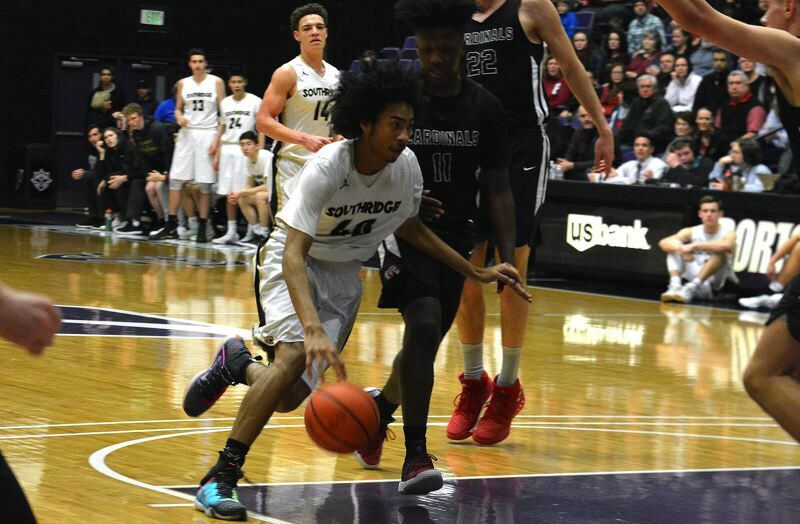 Yet, the Skyhawks, trying to inbound the ball beneath the Cardinal basket, miscommunicated on the pass and threw the ball right to the surprised Sloan, who dribbled out the final three seconds of the fourth to dash Southridge's state title dreams. Fullerton finished the game with 13 points and nine rebounds while Quinlan had 12 points. Bickler added seven points and nine rebounds, seven on the offensive glass.